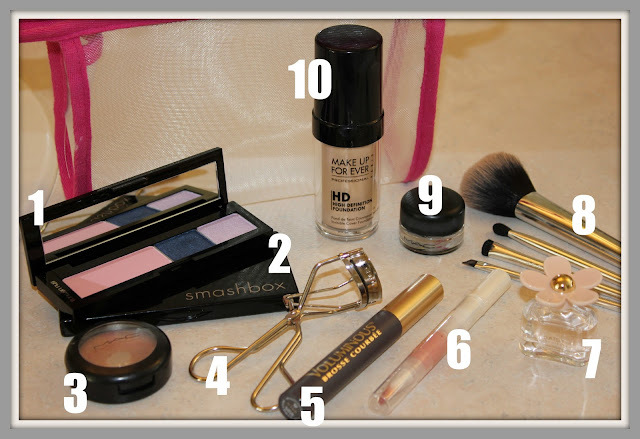 thanks to reader Ashley who requested to know what i consider my makeup bag essentials. here is a list of products that i love, and use, EVERYDAY. Shu Uemura Color Atelier - investing in a high quality makeup quad is worth every penny. i use my Color Altelier for shadow and blush, which means i get great color pay off. smashbox Contour Palette - contouring is a must for my daily makeup routine. MAC Cream Colour - highlighting is just as important and MAC's Cream Colour Base is perfect. Shu Uemura Eyelash Curler - gives those lashes an extra oomph, and works like a charm. L'Oreal Voluminous Mascara - it's inexpensive, works great, and washes easily. a trifecta. E.L.F. Lipgloss - only a $1 for this gloss, but you go through it quickly. however, it is glossy and lasts long. Marc Jacobs DAISY - i LOVE this scent. the travel size allows me to bring it along anywhere. Brushes - these are my SEPHORA Limited Edition brushes. my key brushes include a good fluffy face brush, a fluffy eyeshadow brush, a stiff eyeshadow brush, and an angled brush. you can do anything with these four. MAC Liquid Line - a small black line makes all the difference. this product is easy to apply, doesn't smear, and the little tub lasts forever. MUFE Foundation - there are a lot of foundations i like, but this foundation i LOVE. Heard great things about makeup forever and i definitely want to try Shu Uemura Color Atelier! i am in the market for new foundation and haven't found anything that i love. I seem to either get no coverage, or it looks too caked. any suggestions for foundation on a budget? Love the L'Oreal Voluminous as well. Have tried many others and always come back to it. :) My M-I-L got me Daisy for Christmas this year, which I thought was bold since it's always a risky proposition buying perfume for other people. But I love it! I have been wanting to try this mascara! Love the way that perfume smells. That Smashbox palette is gorgeous! And I love the MU4E HD Founation! It's one of my favorites!